Mike Hoffman wears many hats: lifelong Delaware resident, collector of Delaware memorabilia, society member, and trustee during the 2000s, to mention a few. In more recent years, he has been a key part of improving the Garth Oberlander Barn and Meeker property. One of Mike’s interests has been the circus and Bev Kelley’s work with the Ringling Brothers, Barnum & Bailey Circus, with the county fair and the Little Brown Jug race. Mike presented a Delaware County Historical Society program about the “greatest show on earth” on September 3, 2010, where he shared memorabilia and photographs from his collections. Lifetime Delaware resident Michael Hoffman stands next to one of his circus posters from his extensive collection. Hoffman brought out several pieces from his circus memorabilia and photographs and Delaware County Fair collections to share with the Delaware County Historical Society Thursday night. There’s nothing like a circus, except maybe the Delaware County Fair, according to lifetime Delaware resident Michael Hoffman. 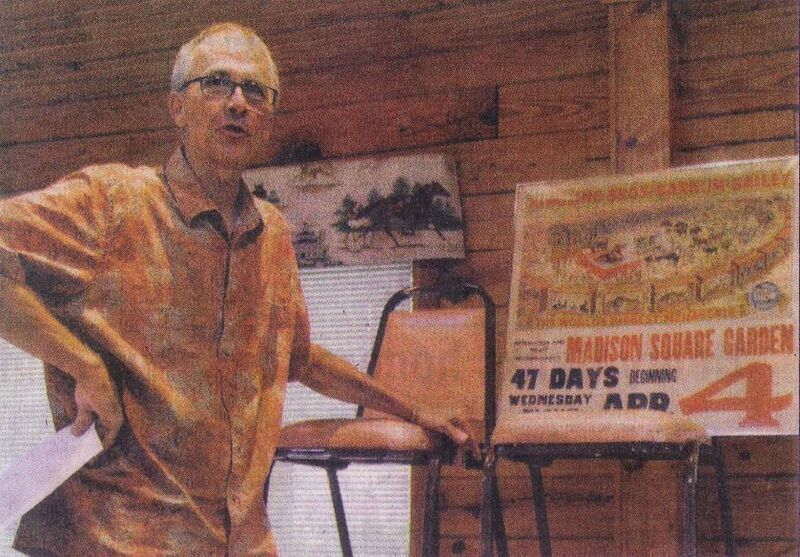 Hoffman displayed part of his extensive collection of Delaware County Fair memorabilia and circus posters and photographs at Thursday’s Delaware County Historical Society program. The Delaware resident became interested in collecting his memorabilia through F. Beverly Kelley, a longtime Delawarean who was active with the Little Brown Jug and the Delaware County Fair. Kelley, a 1928 Ohio Wesleyan University graduate, was also the publicity director for the Ringling Bros. Barnum & Bailey Circus and owned the Blair Kelley Furniture Store on North Sandusky Street in downtown Delaware. Kelley served three terms as president of the Delaware County Fair Board and was instrumental in bringing the circus to the fairgrounds. He also served on the fair board from the 1930s until 1967. Once, Kelley rounded up three elephants and carted them down to Washington Street at the former location of the Sigma Chi fraternity house, as displayed in a photograph in Hoffman’s collection. Kelley also writes about being an usher at the Strand Theatre in his book, It Was Better Than Work. Kelley remembers that the Strand’s manager would not let movie watchers bring popcorn into the movie, so it wouldn’t interfere with the viewers’ experience when the paper bags made noises. Kelley was the perfect publicity director for the circus. Hoffman said. He was always two towns ahead of the circus, schmoozing the town. He would carry around packets of 100 tickets in his pocket, passing them out for free to bring people in. collection. The poster depicts the Delaware County Fair circus acts. He shared his collection with the Delaware County Historical Society Thursday night. 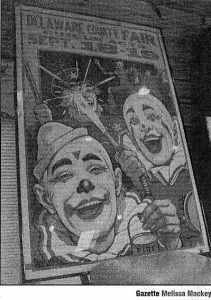 One poster in Hoffman’s collection is from the Ringling Bros. and Barnum & Bailey Circus promoting 47 days in Madison Square Garden in New York City. Hoffman said that the circus would always open at a large city and break off into a red and blue unit, one going south and another north. Each year, the circus was “reborn,” with a new opening act. Hoffman compared circuses and fairs, which many think are similar, he said. However, circuses move from city to city and are self-contained, transported in a semi or car train. Conversely, fairs are five to seven days (unless funded by the state), and are comprised of multiple groups, junior and senior fair, carnival rides, motorsports, food, racing and the general public. Fifty-one weeks are spent preparing for Delaware’s weeklong fair, set for Sept. 18 through 25 this year. “The bad news is this year is a full moon,” Hoffman said.